It was May 2001, and I was cycling out across the gently rolling acres of north Suffolk. Redgrave is one of those large and relatively self-sufficient villages that you get more in the north and west of Suffolk than around Ipswich. However, this was not apparent to me, as I approached it from the direction of Wortham Common. I had cycled through the Long Green, a strange, otherworldly place. The Commons and Greens around here were still, until half a century ago, intensively grazed. Now, they have been let go back to nature, and are in many places covered in gorse and furze, with outcroppings of angular trees. Occasionally, as at Wortham, there are settlements which seem carved out of the common land. Theres nowhere else in Suffolk quite like it. I left this behind, and a deep cutting of a lane led me up and out into open fields. The sun came out, and the tower of St Mary was ahead of me. It is a curious sight. Suffolk has a handful of towers rebuilt in the 18th century. Mostly, they are red brick, as at Layham, and rather less successfully Grundisburgh. However, Redgraves tower is white brick, and would be quite at home in the City of London, if a little more austere than most there. Attached to it is a huge church. St Mary is big; it is a little-known church, but has more to offer than most. 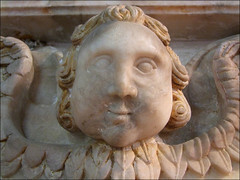 Simon Jenkins ignored it in Englands Thousand Best Churches; most probably, he didnt know about it. It would fit quite comfortably into his three star category along with the likes of Westhall which he also missed. Incidentally, when I met him and pointed out his omission of Redgrave and Westhall, he looked at me as if I was some kind of sad lunatic. I suppose that hes approached by someone with a similar complaint at least twice a day. I stepped inside to a vast space. This church is full of light. The clerestory and aisle windows are huge, and although the east window is full of coloured glass, it too is vast, one of the widest I've seen. It would take hundreds and hundreds of people to fill this place, more than a thousand perhaps; but it was a gentle reminder to me that our medieval parish churches were not built for congregational Anglican worship. Below that first in time, not in degrees. Mortlock thought it the finest post-Reformation brass in England. 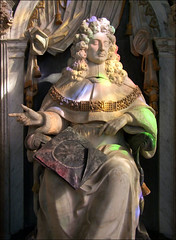 To get to it, you will have to pass an awesome table tomb in the north aisle. 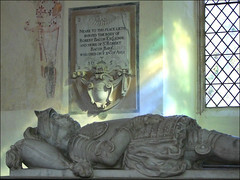 On it lie, life-size, Sir Nicholas and Lady Anne Bacon. Lady Anne was the daughter of Anne Butts (and Sir Nicholas her son-in-law) so we may assume that they are responsible for the quality of her memorial. But the grandeur of theirs quite outshines her, and everybody else. 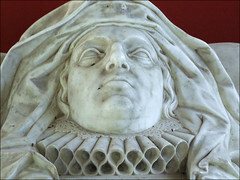 It is by Nicholas Stone, famous for the Coke memorial at Bramfield; she died in 1616, he in 1624. There is an excellent modern window behind it. The Bacons are responsible for most of the thirteen hatchments here - more than in any other church in Suffolk. Others are for the Holt and Wilson families (who later intermarried). The latest is dated 1929. 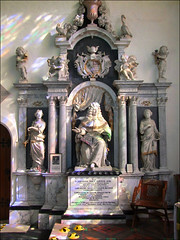 One of the Holts can also be found up in the sanctuary. He's life-size, as you might expect here. 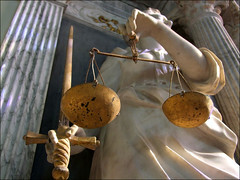 He was Lord Chief Justice of England in the first decade of the 18th century, and he sits in his judge's robes. 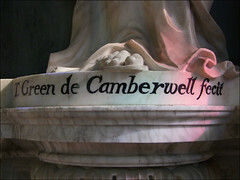 He's flanked by two voluptuous figures who are Justice and Mercy, and the whole piece is by Thomas Green of Camberwell. I know this, because he signed it in very large letters. Perhaps he was particularly proud of it. In this great palace of slightly absurd grandeur, mention should also be made of the vast wooden decalogue hanging in the north aisle. I've never seen Moses and Aaron look so important. It once stood at the east end of the chancel, has ridiculously large scrolls, and would certainly have concentrated the mind. All of this is overseen by that lovely glass in the huge east window. Mortlock tells us it is by a local firm, Farrow and son of Diss. I thought it splendid, quite in keeping with this mighty place. 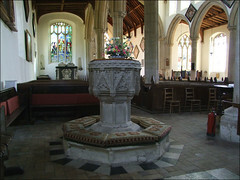 Also in keeping is the white stone pulpit, which is rather camp, although one assumes this was not the intended effect. In 2004, three years after my first visit to Redgrave church, the parish walked away from it. The cost and effort of maintaining this vast barn full of priceless treasures had become too great a burden for the small congregation, so they locked the doors and decamped to the village hall, declaring that St Mary was now no longer their responsibility. As you may imagine, this caused a certain amount of consternation. 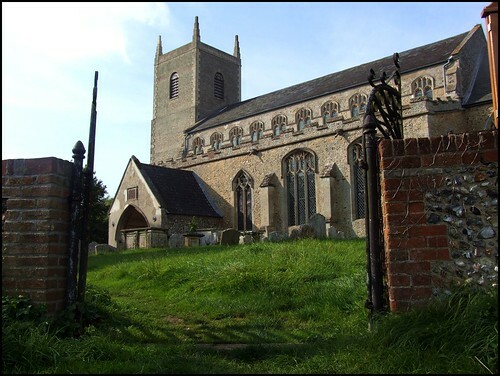 While Redgrave church is a building of national significance, there is a certain protocol required if you want to declare a building redundant and have it conveyed into the stewardship of the Churches Conservation Trust. Not being able to pay the repair bills is not considered a good enough reason to declare redundancy. Even so, the parish persisted, which rather placed the Diocese in a quandary. While their first responsibility was to the parishioners, they clearly did not have the resources needed to look after St Mary, and yet the church commissioners would have looked with some doubt on any attempt to declare the building redundant. It was, in modern political parlance, uncharted territory. 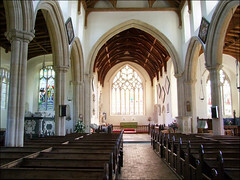 Nevertheless, it was obvious that the ultimate destination must be to ensure the future security and upkeep of the building, and so after eighteen months or so of what one imagines must have been fairly tense meetings, the church was conveyed into the care of the Churches Conservation Trust. And in the meantime, something else had happened. The shock of the incident had galvanised some local people, including a few of the former congregation, to get together and form a group to look after St Mary. With the support of the Churches Conservation Trust this has become one of the most successful support groups in the county, putting on exhibitions and concerts for which the church is eminently suitable. Before the end of the decade, the Daily Telegraph newspaper awarded Redgrave church the prize of English Village Church of the Year. On that occasion I was asked by BBC Radio Suffolk to do an interview about the church while standing in the nave, and as I looked around I thought it seemed a happy ending. 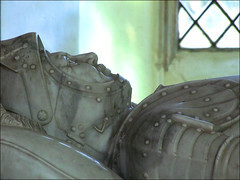 In fact, within a few months I was back at Redgrave church for a quite exciting reason. The Eastern Daily Press of 13th July 2010 takes up the story: It had remained hidden for centuries. But the entrance to a 500-year-old vault beneath a medieval Suffolk church has been discovered after a woman accidentally stamped her foot through one of the floor tiles. 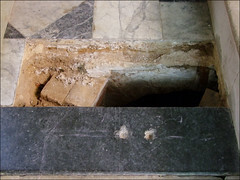 While rehearsing a scene from an upcoming performance of the musical Quasimodo at St Mary's Church, in Redgrave, near Diss, actor Kathy Mills dislodged a marble flagstone near the altar and her foot disappeared into a dark void below. Mrs Mills, who is in her 60s, suffered a swollen ankle, but the pain soon subsided when she was later told she had uncovered a tomb never seen in living memory with coffins inside suspected to contain the remains of the village's past aristocracy. Just weeks before a geophysicist had used an advanced radar to map out where the long-forgotten vault was, but if it was not for Mrs Mills' freak accident they would never have been certain of where its boarded-up entrance was or what hid inside. The church is now hosting an open weekend to give the public a chance to glimpse through the hole and see exactly what they've been walking above all these years. St Mary's Church will be open to the public this Saturday and Sunday, between 10am and 4pm, where a video camera will beam images from inside the vault onto a projector screen. Rumours had circulated for decades that under the ancient slabs of the 14th century church, now owned by The Churches Conservation Trust, laid a labyrinth of passages and tombs. 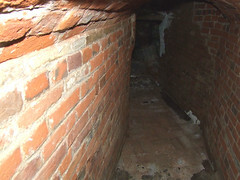 Bob Hayward, chairman of the Redgrave Church Heritage Trust, said stories had passed through the generations of how people walked through the tunnels as recently as the 1920s, but records of their existence cannot be found. In a bid to establish fact from fiction, the group employed Malcolm Weale, of Geofizz Ltd, from East Harling, near Thetford, about two months ago to analyse what lied below. Using a ground penetrating radar, Mr Weale identified a large void, about 6ft deep, spreading under the altar and into the adjacent vestry. The Trust was prepared to leave its investigations at that until the day of Mrs Mills' fateful accident just over a week ago. It is thought the coffins belong to descendents of the Holt family. 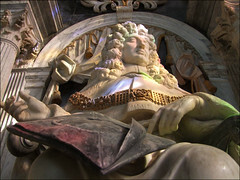 Sir John Holt became lord of the manor in 1703 and a large memorial to his life sits above the newly uncovered vault. 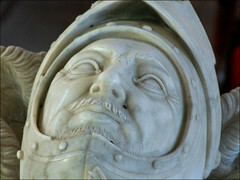 However it is believed to have been built in the late 1500s by the Bacon family, but their remains are located in another tomb beneath the church's font. Archaeologists will be descending into the vault at the end of the year to assess whether any of the other supporting timbers are rotten and to record what's inside, but the coffins will remain as they are found. Now, this was something I had to see. The hole was about 20cm by 40cm. Bob Hayward very kindly opened it up the hole for me and allowed me to lower my camera into it - it wasn't safe to go down there, because of the high concentration of carbon monoxide. How exciting! My photograph showed the high-vaulted tunnel of 18th Century brick, and in a room beyond there were five lead coffins, almost directly under the magnificent Holt memorial. This was a fascinating experience, and all in all St Mary is a fascinating church, one of the best in East Anglia, despite what that Jenkins book says. It is not understated, it never attempts to be tasteful or refined. After the thrill of exploring the tunnel, I sat for a moment on the steps leading up to the organ at the west end, surveying the wonderful brick floors, the expanses of light beneath the arcades, the awesome seriousness of the chancel. If, at that moment, a group of 18th century ladies and gentlemen had stepped out of a Samuel Richardson novel and into this church, I should not have been the least bit surprised. And curiously, Redgrave village is not the largest population centre in the parish. That honour goes to Botesdale, down on the main road, and part of the extended village of the Rickinghalls. Botesdale has its own church, but strictly speaking it is a chapel of ease to this one. The most famous residents of the parish these days are not Bacons, Holts or Wilsons, but the extremely rare great raft spiders which live in Lopham fen, to the north of the village. It is one of only two places they are found in the British Isles.